Hundreds of thousands of demonstrators, alarmed by the Trump Administration’s assault on the environment, poured into streets in US cities in historic numbers to sound the alarm about the planet’s warming climate this weekend. And though Donald Trump has since his inauguration mounted an unprecedented attack on domestic environmental protections, and by turn, the health of the planet, those who turned out in American cities Saturday say they are ready to claw back. 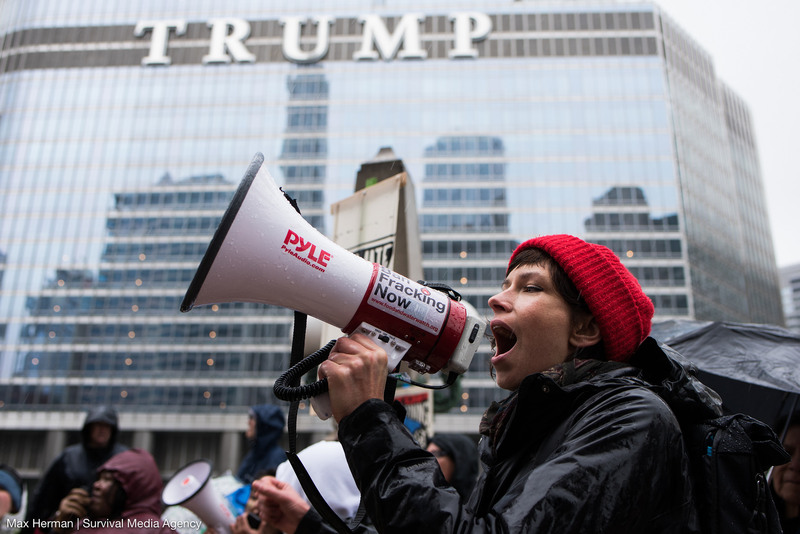 The marches, which marked Trump’s 100th day in office, found their roots in 2014 with the People’s Climate March in New York City. Then, 300,000 people gathered to pressure the United Nations toward the Paris Climate Accord. That demonstration gathered a global urgency and culminated in the victory of the world’s biggest international climate deal. This year’s People’s Climate March was even bigger – and so, too, was the threat. Since coming to office, Trump has set a tone of rolling back hard won environmental victories of the Obama administration, and with his threats to pull America out of the Paris accord, he’s renewing Washington’s previous attitude of indifference to the world climate. On Friday, before the march, Trump fired off an executive order that opens the Arctic Ocean to drilling and exposes the Eastern Seaboard to oil exploration. The same day, the Environment Protection Agency scrubbed all climate change science and data from its website. A month ago, he began chipping away at the Clean Power Plan, America’s central promise to the Paris climate deal limiting carbon dioxide emissions from coal fired power plants. He’s also promised – impossibly – to restore the hey-day of the US coal industry, which long ago surrendered to natural gas and a steady growth in renewables. And, of course, Trump has called climate change “bullsh*t” and a “hoax.” But Americans, like never before, are taking notice – and they disagree. An April 20 poll from the Pew Research Center shows 74 percent of the country wants to do “whatever it takes” to protect the environment. 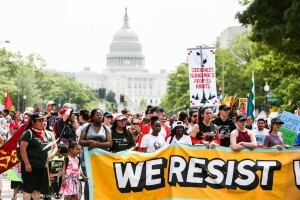 On Saturday, 400,000 of them turned out to march in Washington DC, and they were joined by thousands more in 350 cities across the country, making this year’s People’s Climate March even bigger than the first. And people aren’t only marching about climate change; they’re reading about it and hooking up with other marchers on social media like never before. Google trends reports cited by the polling analysis group FiveThirtyEight show that since the original demonstrations, news headlines have used the term “climate march” more than at any time since the service began collecting data. To be sure, this year’s People Climate March was a long time in the planning, and many of the marchers figured they would be rousing Hillary Clinton to redouble US efforts to avert climate catastrophe, not prodding Trump away from trashing them all together. 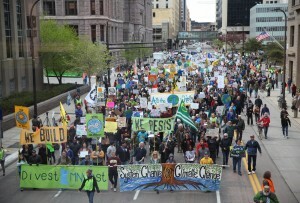 Climate marchers in Minneapolis, Minnesota. Trump is making a point of pleasing the fossil fuel industry. He reopened work on two major oil pipelines in the US, the Dakota Access and the Keystone XL, proposed gutting any programs that fund clean energy and energy efficiency, and he has issued order after order to bolster fossil fuel development. The marches galvanized a lot of anti-Trump sentiment. 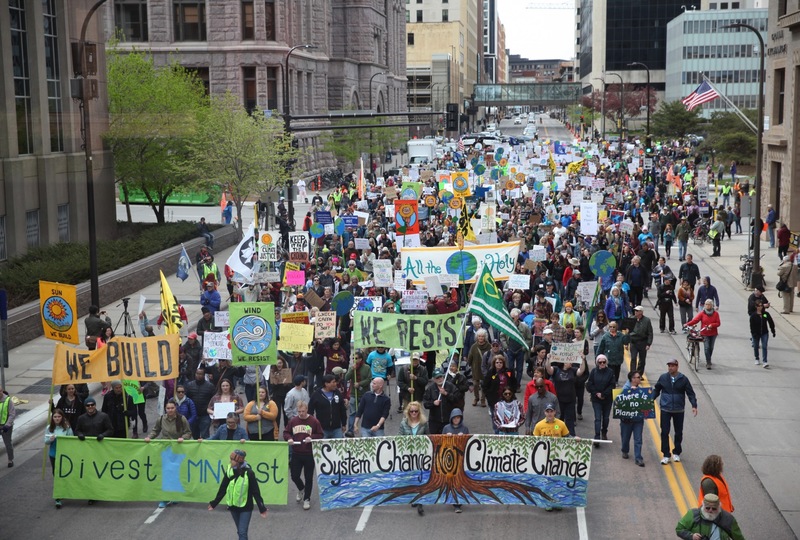 Francesca Gold, marching 1,000 miles west of Washington in Minneapolis, Minnesota, said the climate march wasn’t the first she’d been to under Trump. In New York City, the climate march joined with another march, called “100 days of failure,” one of the city’s near weekly demonstrations against Trump since he took office. And back in Washington, demonstrators chanted, “Resistance is here to stay, welcome to your 100th day,” before issuing collective roar to symbolically drown out the voices of the administration’s climate deniers. Trump himself wasn’t there to hear it. He was in Harrisburg, Pennsylvania holding what the White House called a “campaign rally,” promising his supporters coal jobs. But if Saturday’s marches are any indication, the rest of America isn’t ready to follow him into the past.